Register Log In Machine Builders Network+ Forums General Discussion Look What Followed Me Home! Last edited by GatorS; 02/19/2019 01:38 AM. this was and probably will be again the best topic for conversation.. How did we forget it in our build? Got this today. It was cheap (I think). Now I have to figure out how to make it work with my TIG. I also have to get a water cooled torch. Last edited by GatorS; 02/25/2019 01:05 AM. Sweet rig! I'm sure you would already know but once you get used to the additional weight and bulk of a water cooled torch you will be spoiled for life. I would have loved to have used one welding cracks on jet engines but laying on your back and sometimes working through a mirror the gas cooled was the only way to go. If you really want to mess with your mind try the mirror thing.......only a few of us welders could do it. I always said I had a backwards mind sometimes! The mirror thingy would mess up everything! ---I never got very good at it! --- Only had to do it a few times! Wow! I just realized this is a thread I started years ago! A lot of water has gone over the dam since, some good, some bad and some downright horrible. I have a few things that have followed me home between then and now, as soon as I get things done herein the next couple of days I will try to post some pics! once you go water-cooled there's no goin back Gator..I started with an air-cooled TIG torch,man I wont even try to use one of those anymore..you can get deals on a good Weldcraft WP18 water cooled torch on eBay..I bought one there as a spare..the torch hose covers are expensive here at the LWS, eBay has them cheap too..its the kinda thing you just buy once..mine has lasted me almost 30yrs. 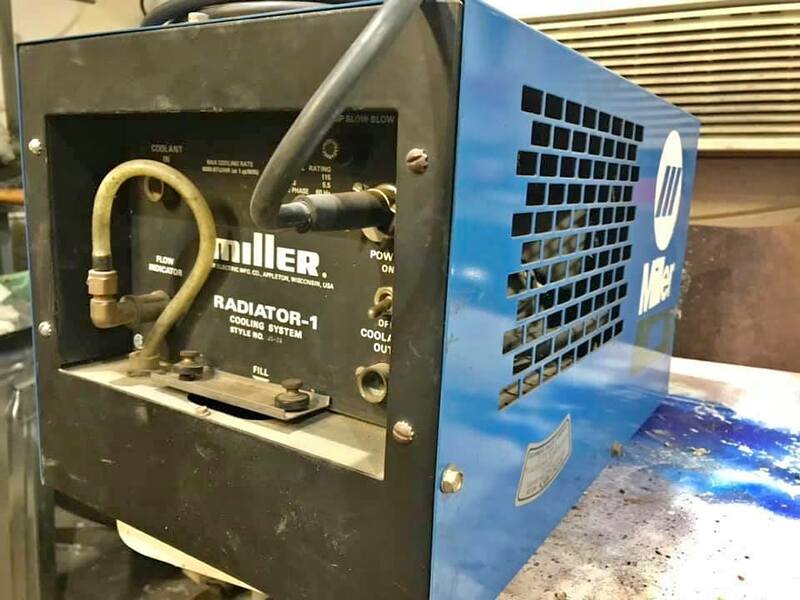 The Miller radiator coolers seem to be good units,the pumps are still rebuildable..it should have a screen on the inlet side,under a cap..it might be missing,too...important piece to have on it.-be sure to diassemble it and clean the pump out,a lot of 'em get gunked up and have low flow..I have a pair of Bernard coolers,one on a Syncrowave and the other in storage for a Lincoln TIG. Be careful to use the right antifreeze in the torch and cooler,a lot of guys use automotive glycol A/F but it will clog up the orifices in the torch unless you run it real thin with water.I use the Miller coolant.FWIW best of luck. I joined a FB group for the welder I have. I posted about how to hook it up with the welder. One of the guys suggested making another tank for the cooler. The lid doesn't really seal. I think I'm going to make a small replacement tank for it. I did plug it in and hit the switch for a blip. The pump spun but made a not great noise. I didn't rund it but about a 1/4 second. I'll probally clean the tank and see if it will pump before I decide to go too far with it. I'll try to rebuild it if it is messed up. I have a lot going on other than building stuff at the moment. I hope to get to it in the near future. 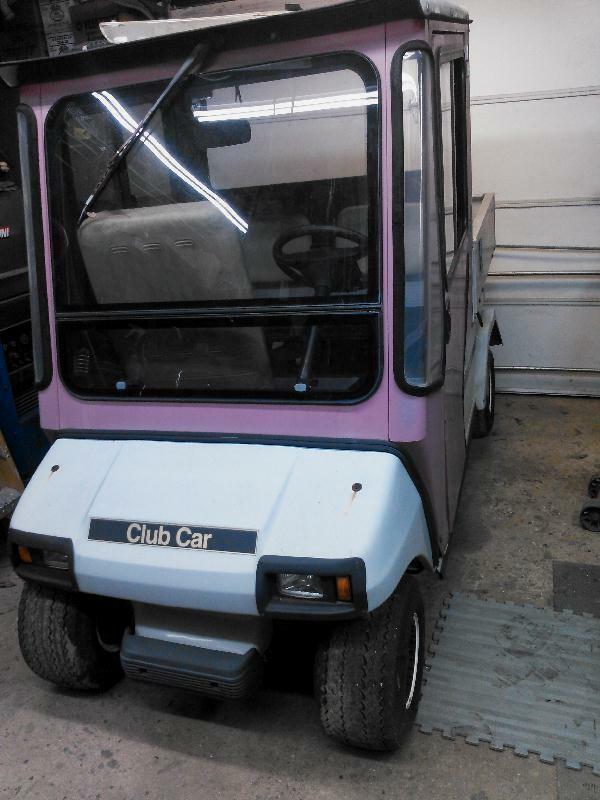 got a new toy-Club Car "Turf1" industrial golf car, Kawasaki gas powered with aluminum frame and manual dump box..not in too bad shape,just been sitting for a while(like 5years-whew!) 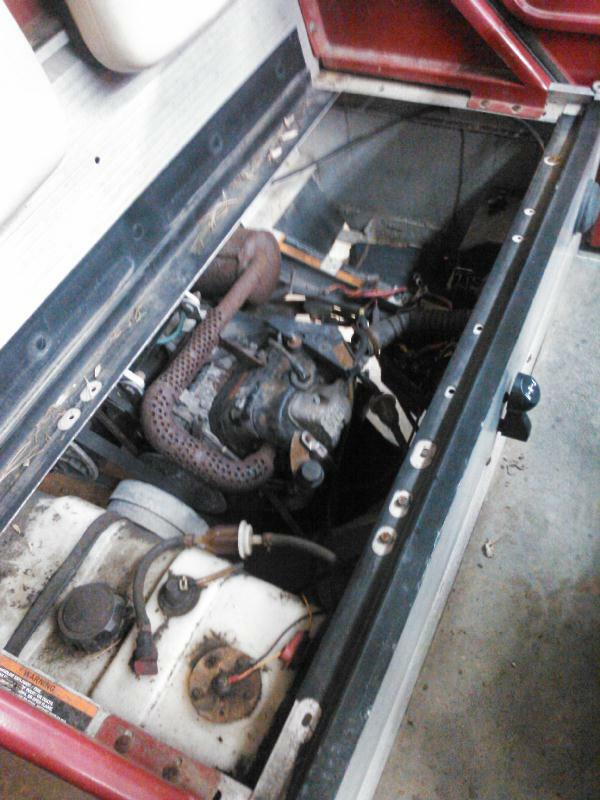 so the gas is bad, gotta go thru it and do a PM and fix some electrical problems,microswitches on the transmission selector..may also need a new carb if I can't clean this one out...I think thats why they ditched it..got it for free..best deal yet, but I dont have it running yet..time,beer and pretzels will tell..it all helps with the diagnostics. As I get older I can appreciate a good golf cart to get around,box on the back is good for hauling tools too..great for those long country lanes out to the mailbox,altho the exercise will do me good,just not in the rain..
Good find on the golf cart. I paid $100 for the tig cooler. Couldnt pass this mini-monster up. 2 cylinder Hatz diesel engine with hydraulic pump, 3 hydro motors, articulated steering, hydrostatic drive, 2 lift cylinders, all associated control valving, and very stout frame and axles. Lots of good parts here and it all works. Hopefully the photos below will show up or the links to the photos will work. Probably wouldn't take much to convert that to a loader, 4x4 tractor, etc. looks good! 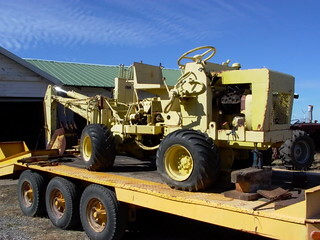 this is one that I got a few years back to take backhoe off of and put it back on my 420-u John Deere tractor loader. The hoe was originally on the 420 when it was new in 56. At some point in time the hoe got taken off and sold to a guy that put it on the remains of the Vermeer unit. Last edited by sonny; 03/10/2019 05:18 PM. Nice. It seems like these trenchers are built super tuff. I'm amazed that you found your old backhoe. For mine, I was thinking about something like a mini 1 person bobcat toolcat type machine. 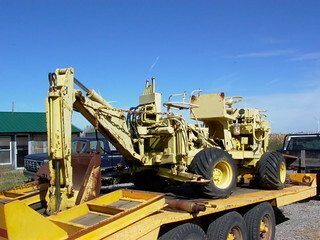 Loader/grapple bucket in front and a dump bed in back. Good for cutting trees, moving wood, snowplow, etc. Any other ideas? Maybe a 3 point hitch is better than a dump bed? I will work on how to post up photos so they show up in the body of the post like yours did. Last edited by CatalystMJ; 03/04/2019 07:51 PM. We use Flickr It's easier and free..... Sonny I see you got the cut off on the HTML figured out to get rid of the extra junk text that showed up before. I bought a case trencher to make my skid steer back hoe out of. I've got plans to make a dozer attachment out of it also. I scrapped the body but kept the axles thansfer case and the motor. I've also got the stuff to make a trencher attachment out of. Once I found the right point in the string, it was easy to do. I did get a couple books that I have been looking at. Getting more of an idea of whats going on, got a long ways to go yet! These old trenchers have ton's of parts on them. Hyd. motors, valves, etc. Mine has most everything except the blade, digging boom, and the original hoe. The current hoe is the one that came off my 420 tractor. I tracked down the serial # from the original village that bought it new in 1956. The serial # on the hoe matches the invoice that they had a copy of. Kinda weird but that's the way stuff goes. I was told that the hoe was taken off so they could put a big platform on the back and stack weight on it for loader traction. The hoe wasn't heavy enough I guess. I never push the tractor that hard, mostly use it on dry ground. I use the skidloader for the hard stuff. Last edited by CatalystMJ; 03/10/2019 07:44 AM. Alright, looks like I got the photo issue sorted out. Hope you all can see the actual photo inline with the text now and not just a link to the photo. So, my new trencher is 2 cylinder Hatz diesel 30 HP with two hydraulic pumps. Trying to buy a property soon with trees and I'm thinking a tree machine would be a good conversion for this. This has 3 hydraulic motors (boring, trencher, and shaker). Do hydraulic motors normally have any speed or other ratings stamped on them to indicate what there capabilities are? I would also like to use this machine as the power setup for my future hydraulic sawmill. Hoping one of the motors would work as a bandsaw motor as I won't need all the motors on this in its new configuration. Put an offer in on a new property so I hope to be moving soon to a spot in central Virginia. Yes sir, appreciate your thoughts! Going with your plan to get rid of the vibratory plow and use that area for the grapple bucket. Thinking bed in the back for the weight as you suggested and load it up with tree cut offs. Used to live and work in Rockville, MD so its nice to hear from a fellow east coaster. Keep moving further away from DC as I get older. If you can get a speed tac. on the end of the shaft, that would give an idea of what speed they run. I took a couple off and hooked 2 hoses up and ran them just to test for speed. Not real accurate, but you get an idea of possible starting point. On you machine, I would imagine the motors are quite hefty. On a side note, do you plan on removing any stumps? the vibe plow can serve to cut roots up close making them easier to get out. The unit looks well made, so it should stand up to heavy use. I probably wont run fast so you may have to see or test that part out before you take it apart, then if speed needs to be increased, deal with that first, then build up from there.